How to Upsell and Cross-sell your products on shopify website? Blog » Conversion Optimization » How to Upsell and Cross-sell your products on shopify website? In this post, we are going to discuss upselling and cross-selling strategies which you can use on your Shopify website. Upselling and cross-selling techniques are highly effective and they have been used by various companies, brands and online businesses to boost their sales. 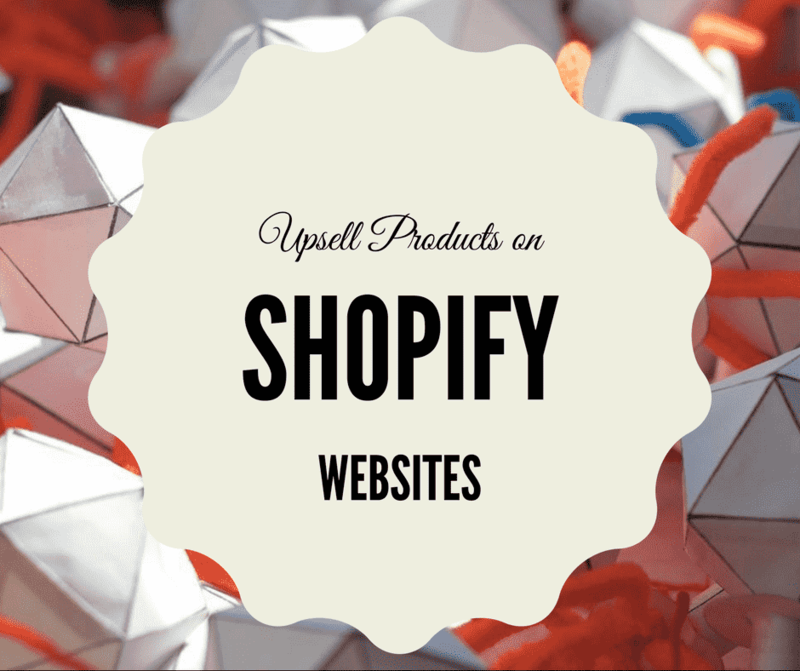 On Shopify, there are some extensions as well which you can use to upsell your products. Let me first define what is upselling and cross-selling and what is the difference between them. So, how to upsell products on Shopify? Many Shopify stores these days use different sales promotions techniques throughout their website and marketing material. They create sales trigger events to upsell their products. Businesses use a variety of different upselling techniques to boost sales. To upsell your product, it is quite important to know and understand your customer’s background, budget, and needs. This will help you create better sell copy on your website. Upselling is a sales technique used to persuade a customer to buy expensive items, add-ons, and tools to make a more profitable sales. For instance, you can sell laptop add-ons, tools and upgrades when offering your customer to buy a laptop. It is a sales techniques to improve sales of a business through selling similar products or 2 different products often bought together. You can use a variety of tools and techniques to upsell products on Shopify. There’s a huge difference between upselling and cross-selling. So don’t confuse them with one another. Let’s check out different techniques which we can utilize on our Shopify website. Call to action can be a single anchored text link or a button. CTA’s are often used to send a customer to sell’s page. Using call-to-actions you can increase your Shopify sales drastically. Interlink similar products or use plugins to show similar products/or products bought together on your sells page. You should also A/B test different positions, pages, and placement of CTA’s in order to find the right placements. You can use Google analytics to test this process. If you are not really utilizing email campaigns for your Shopify business then you are losing an incredible amount of money. Email marketing can be used to upsell or cross-sell products. For example, when a customer buys a product from your store, you can send an email to upsell or cross-sell products. It is a great opportunity to boost your store sales. I would highly recommend you to properly set up opt-in forms as well as collect emails from any form of your website that you can. Use those email addresses in your email marketing campaigns. Internal links are used to enhance user experience as well as SEO. There are a lot of benefits using proper internal links structure on your Shopify site. Make sure that all the external links on your Shopify website are nofollow. Internal links improve your website ranking. They pass link juice from one page to the next page. Internal links will boost your conversion rate high (placement of the links is important). You can use internal links to send traffic to your sells pages. Offering discounts on your shopify store can boost your sales. It is a highly effective and an old sales strategy. If you want to increase your Shopify store sales, you should consider offering discount, promotional codes, shipping discounts, and so on and so forth. It boils down to a better understanding of your customer pains. If you know how to comfort them, you can manipulate and upsell your products. If you don’t have an understanding of customer’s background and their pains, It would be difficult to convince people even to buy a product from you in the first place. Learn from your competitors, what audience they are targeting and what’s their strategy to tackle their customer issues. Improve customer’s engagement with your brand and build a community around your customers. Use all the collected data with the above techniques and I am sure you will see a quick improvement in sales by at least 40%. If you like this post and want to further improve your Shopify sales, make sure to subscribe to my newsletter.